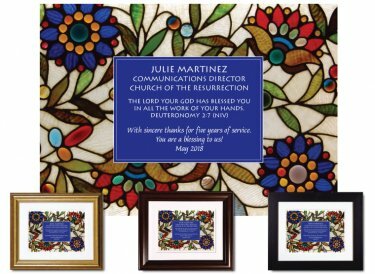 Convey thanks for dedicated service with a personalized appreciation plaque. Vivid photograph of a stained glass window provides the backdrop for this excerpt from the Book of Deuteronomy: The Lord your God has blessed you in all the work of your hands. Original design. Hand-finished using premium archival materials. Framed & Finished - Printed on premium paper with archival inks and double-matted with conservation-grade matboard as above; mounted using acid-free foam core backing; framed using distortion-free UV acrylic glazing. A protective dust cover and wall guards are applied to the back. Your choice of gold, walnut, or black wood frame (view frames here); ready to hang. Finished size: 10"x12"
Custom created with your personalization upon order. Please allow us up to 5 business days to complete.